Decades of research from the University of Chicago¹ confirms that writing five or more times per month across subjects helps students become college- and career-ready. When students write, they hone the literacy skills vital to 21st-century success² – communication, collaboration, critical thinking, and creativity. Additionally, an independent, controlled study showed that when students use writing platforms like ThinkCERCA to fidelity – alongside instructional best practices – they can gain two years of academic growth in one year³. In consideration of these factors, this guide will provide an overview of how administrators can successfully roll out a writing initiative that amplifies every aspect of the Instructional Core, particularly with improving teacher knowledge and skill as it relates to writing instruction. 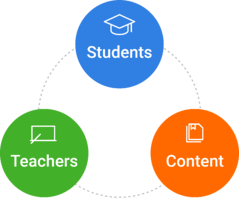 The Instructional Core is the relationship among teachers, students, and content – the three factors that can be harnessed for transformative change throughout a school⁴. Leaders cannot change just one element of the Instructional Core to drive results. All aspects of the Instructional Core shift when one aspect shifts. Teachers: Are teachers prepared to deliver effective cross-curricular writing instruction? Students: Are students engaged in their learning? Content: Is the content aligned to standards and appropriately challenging? For students to achieve the academic growth demonstrated in successful writing initiatives, they need to write across subjects. Not all teachers, however, receive explicit training in writing during their preparation as teachers. Even fewer teachers receive training in how to teach writing. As an administrator, it’s essential to provide all teachers with the high-level training to guide students through the writing process. After all, there isn’t a state or country today that doesn’t assess writing in a high-stakes test, and the skills students gain from writing are essential for success in the Information Age. Help teachers feel comfortable with the practice. Hold regular PDs before and during the initiative to train all teachers on literacy best practices. During these sessions, provide teachers with the opportunity to practice their own writing and the process of providing feedback. Help teachers feel comfortable with technology. Technology tools offer many supports for emerging writers and can dramatically improve outcomes. Make sure teachers have ample time to explore these tools before using them in class. Additionally, designate an “ed-tech ambassador” – a point-person on questions related to tech. Coach teachers on providing feedback on writing. If students don’t know what they could be doing better, they won’t be able to improve. Teachers will be more effective when they develop routines that allow them to provide specific and actionable feedback for students. Not all of that feedback requires expertise in the conventions of English. The most powerful feedback content area teachers can provide may lie in helping students explain their reasoning more clearly. Collaborate with the team to regularly determine the focus of feedback. This will help build teacher capacity and help the team be responsive to students who will grow rapidly and have changing needs. Guide teachers through leading a structured class discussion. Writing isn’t just about putting words down on paper. It’s about making thinking visible. Discussing ideas with peers and considering alternative perspectives is an important part of the process of developing arguments across content areas. Provide resources to help make sure teachers are comfortable facilitating discussion and debate throughout the writing process. This can be accomplished through whole-group discussions, leveled groups, or peer-to-peer activities. Effective PD isn’t a one-time, off-campus event. By embedding professional development in peer-to-peer observations, collaborative scoring sessions, and Response to Intervention meetings (where teams plan ways to address individual student growth opportunities) teams will continually enhance teacher knowledge and skill. Students need access to a coherent, standards-aligned, and appropriately challenging curriculum that guides them through developing knowledge and skills along a continuum. It’s the administrator’s job to ensure access to that high-quality content. Doing the right things is Step 1. Doing those things right is Step 2. The research behind the Instructional Core posits that changing the content is one of just a few ways to improve student learning across a school. In the context of a writing initiative, this means that students should engage with real-world texts that help them work through a relevant, debatable question. Students need explicit instruction in skills and concepts in order to build the working vocabulary to develop and improve writing. As students progress, there will be new expectations for learning. It’s important for educators to understand the nuances between a written claim that represents mastery for a 6th grader versus a claim that represents mastery for another student who is farther along the continuum. Ed-tech tools and other tech-based resources can help ensure classes have access to rigorous and relevant texts, and save teachers the time spent searching for those texts on their own. There are many ways to differentiate. Students need to be appropriately challenged in their work, which means that “watered-down” texts (texts that change the vocabulary words to change the reading level) should not be the only sort of text struggling students read. They must have access to authentic texts that are written for appropriate levels. After all, Google will not rewrite search returns at a new Lexile, and all students need to practice navigating the kinds of texts they will encounter in the wild. In a schoolwide writing initiative, collaboration can impact all three elements of the Instructional Core. To support all teachers in delivering high-quality writing instruction, teachers can share – across grades and subjects – what’s working, what’s not working, and which skills gaps can be addressed next based on grade level, leveled learning group, or individual results. To make the writing initiative work across grades and subjects, schools need a consistent language and shared rubrics to use in relation to writing. Teachers in all departments can use these materials to plan lessons and activities together, helping students make cross-curricular connections to what they learn, rather than struggling to understand discipline or teacher-specific language. Before finalizing a formal written argument, students should have ample opportunities to discuss their perspectives with peers – thus solidifying their ideas and considering alternative perspectives. In order to increase active mental engagement, teachers can support students by creating the context in which it is meaningful to put forth ideas and effort. For many students, these contexts are social. Educators can tell the difference between a passive class going through the drills and an active class in which students bring a new dimension to discussion. It all depends on the role a student plays in the learning process. When students are engaged in their learning, they can realize the power of their own ideas and those ideas spark courageous thinking among peers. This ignites the kinds of classroom experiences that mirror 21st-century workplaces and important civic discussions. At the start of a lesson, provide students with background information on the topic, showing them why the topic matters to their experience. Ask students to think about a personal connection to the topic. This will help students establish the significance of the topic and connect it to prior knowledge. During discussions and debates, teachers can also provide coaching to students – prompting them to think about additional perspectives and clarify their reasoning. Coaching students to prompt each other in these ways is also a way to increase active mental engagement for students and to increase the social motivations for participating positively in discussions and debates. Just as students may need explicit instruction in discussion and collaboration, teachers should assume students need explicit instruction in a number of key areas of writing. If teachers themselves have gaps in writing instruction, leverage resources like ThinkCERCA to help provide equitable education opportunity access for students. When instruction is effective, content is rigorous, and students play an active role in their learning, the pieces of a writing initiative can fall into place. The only thing left to do, as an administrator, is get the ball rolling. Own writing as a core initiative for the school or district by setting clear expectations for quality practice, content, and student engagement. Get a clear sense of what’s happening in classrooms. Observe, look at samples, and ask questions. Get a sense of what the indicators for success should be. Empower the team – invest in the content, the tools, organize the trainings, facilitate collaboration, and answer questions. ThinkCERCA's Executive Director of School Innovation, Dr. Kavita Venkatesh, discusses the research behind the Instructional Core and how school leaders can use writing to impact learning at scale. ¹Allensworth, Elaine, Macarena Correa, and Steve Ponisciak. From High School to the Future: ACT Preparation--Too Much, Too Late. Why ACT Scores Are Low in Chicago and What It Means for Schools. Consortium on Chicago School Research. 1313 East 60th Street, Chicago, IL 60637, 2008. ²Polder, Michael, Vincenzo Spiezia, and Giorgio Presidente. "ICTs and Jobs: Complements or Substitutes?" June 2016. http://www.oecd.org/officialdocuments/publicdisplaydocumentpdf/?cote=DSTI/ICCP/IIS(2016)1/FINAL&docLanguage=En. ³"Finding What Works: Results from the LEAP Innovations Pilot Network." 2016. https://www.leapinnovations.org/wp-content/uploads/2018/08/PN_C1_Research_Brief_FINAL_red.pdf. ⁴City, Elizabeth A., Richard F. Elmore, Sarah E. Fiarman, and Lee Teitel. Instructional rounds in education: A network approach to improving teaching and learning. Harvard Education Press. 8 Story Street First Floor, Cambridge, MA 02138, 2009. ⁵Fisher, Douglas, and Nancy Frey. Guided instruction: How to develop confident and successful learners. ASCD, 2010.